Though the Final Five may have already taken home their last medal in the Rio Olympics, fans of the powerhouse girl squad will still get to see plenty of the gymnasts. In keeping with their new household name status, the five Olympians will be gracing the cover of People magazine, as the magazine announced via a tweet Wednesday. It's a well-deserved cover, too. Perhaps no other athletes in this year's summer games have caught attention like the Final Five. Sending them off with a cover on America's largest magazine only seems fitting. 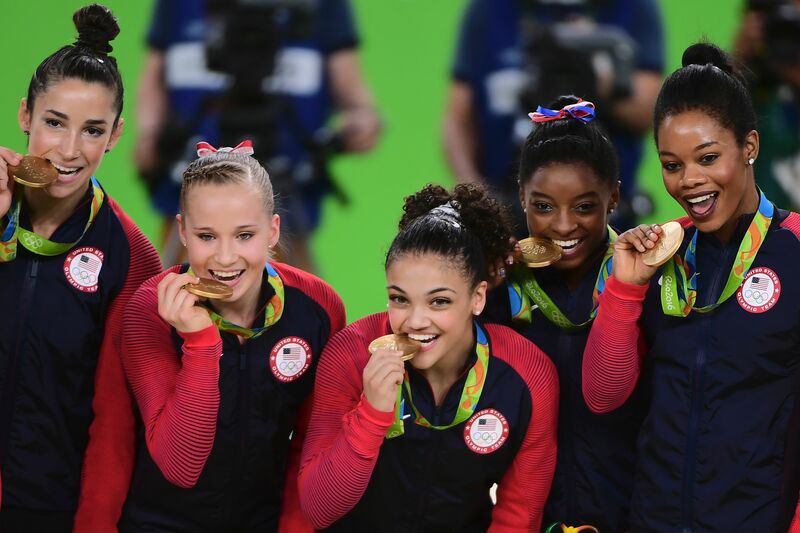 The cover features the five athletes — Simone Biles, Aly Raisman, Gabby Douglas, Laurie Hernandez, and Madison Kocian — posing with their medals. Each woman won gold for the U.S., with Biles taking home a record-smashing four gold medals. The Final Five's rise to prominence in the Olympic gymnastics arena began early, and they soon captured the hearts (and covers) of both American and international audiences. As People promises, their segment of the magazine will include the athletes sharing "their emotional journey to gold." The magazine will also feature an interview from another Rio 2016 favorite: Raisman's mother, Lynn. Raisman's parents also became household sensations when their nervous (yet wholly adorable) reactions to their daughter's routines were caught on NBC's cameras. This won't be the only time fans will get to see the Final Five grace a cover, though they won't be on the Wheaties box in the old tradition of Olympic champions (General Mills wasn't a sponsor of the games this year). Instead, the women will be featured on limited-time boxes of Kellogg’s Special K Red Berries. The boxes will have a photo of Biles on one side, and the Final Five as a group on the other. Biles is also being featured on the most recent cover of Sports Illustrated, alongside American swimmers Michael Phelps and Katie Ledecky. With this being his 11th Sports Illustrated cover, Phelps knew how to get the right shot, and reportedly even helped Biles and Ledecky arrange their medals for the shoot. It will be nice to have the Final Five stick around a while longer following the Rio Olympics. This may be the last time they all compete together. According to NBC, Kocian doesn't plan on returning to the Olympics stage, and is content to compete at the college level for UCLA.